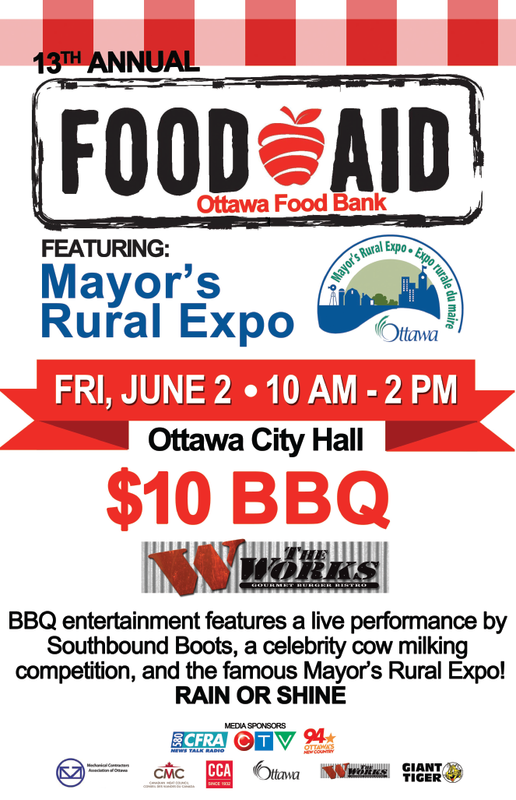 June is fast approaching, and the annual Food Aid BBQ and Mayor’s Rural Expo is right around the corner, taking place on Friday June 2 at City Hall. This year’s event will be special, as it is included as one of the FCM conference tour stops. We anticipate up to 100 municipal leaders from across the country to attend. I look forward to this unique day, which provides an opportunity to showcase all that rural Ottawa has to offer in a downtown setting. The event is sponsored by Bell Media (CTV, 580 CFRA and Ottawa’s New Country 94). Vendors selling and promoting rural goods and services will be on site starting at 10 a.m. The Ottawa Food Bank’s BBQ lunch, serving THE WORKS burgers will take place from 11 a.m. to 2 p.m. at a cost of $10. The celebrity milking contest will begin at 12:15 p.m. and Southbound Boots, a local Ottawa band, will be performing live over the lunch hour. All lunch proceeds are donated to the Ottawa Food Bank for the purchase of local beef for those in need in our community. I hope to see you all there!